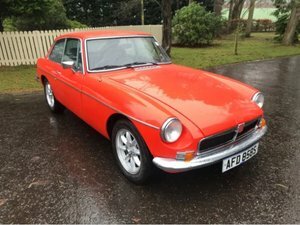 My aim was to restore this car, at least as close to, its original state as the early Mark 1 MGB GT’s are becoming increasingly rare. A change in circumstances means I am no longer able to complete this project. 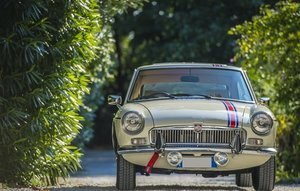 This car has a lot of documented history, including its original green log book and many renewed parts. It still has a solid roof. The chrome and paintwork is generally in pretty good condition, although it requires TLC in places. 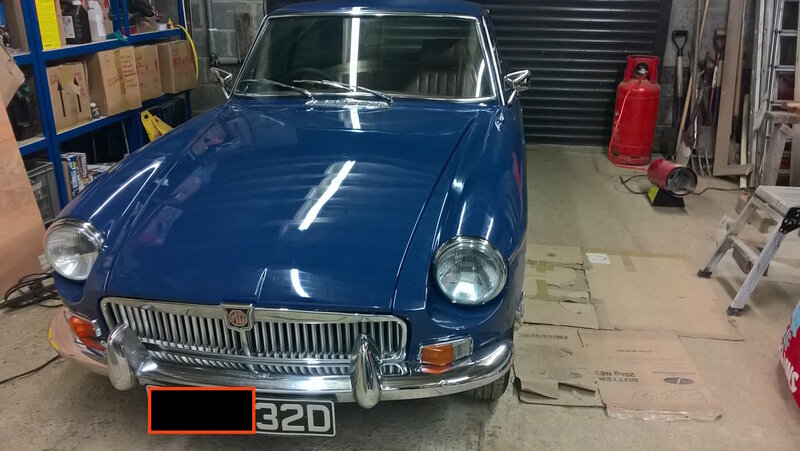 Whilst it has undergone a considerable amount of restoration over the years, the previous owner wanted to ‘modernise’ it. 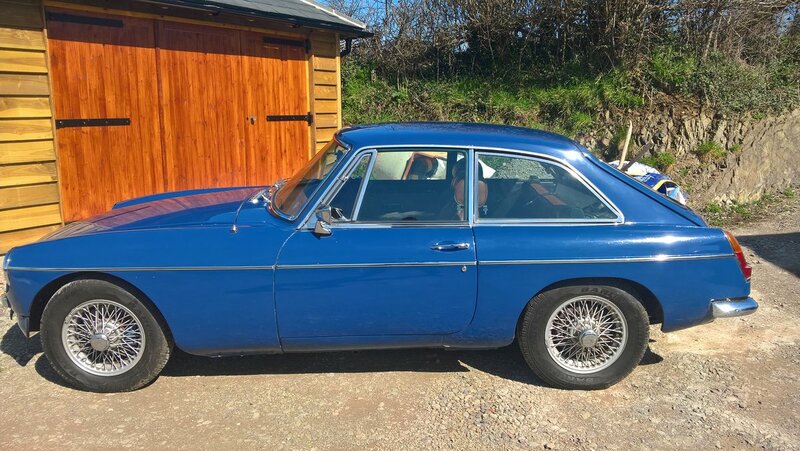 Whilst perfectly comfortable and serviceable as it is, I wanted to change the interior back to the original 1966 trim colours and dash fittings and to reverse the ‘modernisations’. 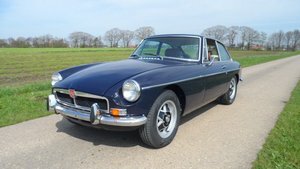 Fortunately, should you wish to do this, virtually all the parts it needs are readily available from most MG spares suppliers. A list of the main parts identified as being required is available upon request. I must emphasise that this is based on my personal opinion and no warranty is either given or implied that this is the entire scope of any work that may be required. The purchaser must rely on his/her own assessment. 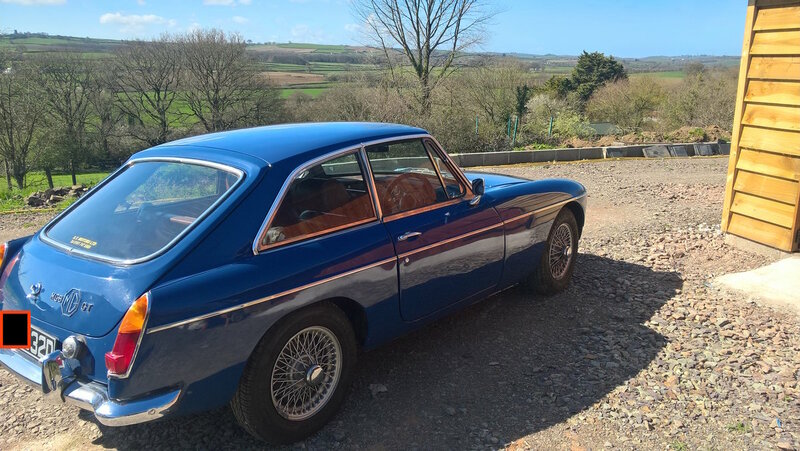 Before embarking on the project I took the car to our local family-run garage, owned by one of our fellow MG club members for a professional assessment of the work it would require. They have many years’ experience with classic cars. It was put through a ‘pre MOT’ and taken for a test drive. They were pleasantly surprised at how well it drove and handled. Generally, the car drives well and is in good working order. 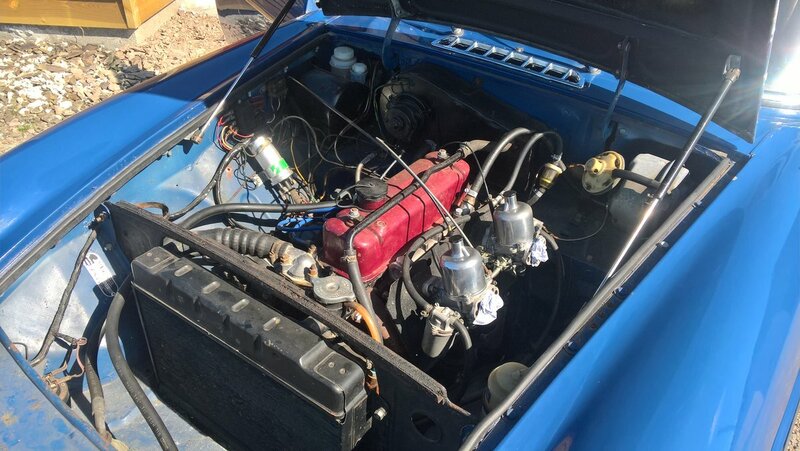 The replacement engine has good oil pressure, has new carbs and is responsive and pulls well. The gearbox is sound, no problems with synchromesh and with working overdrive in 3rd and 4th gears. It has been converted to 12v battery and electronic ignition. SS exhaust. Good tyres and wire wheels, including spare. 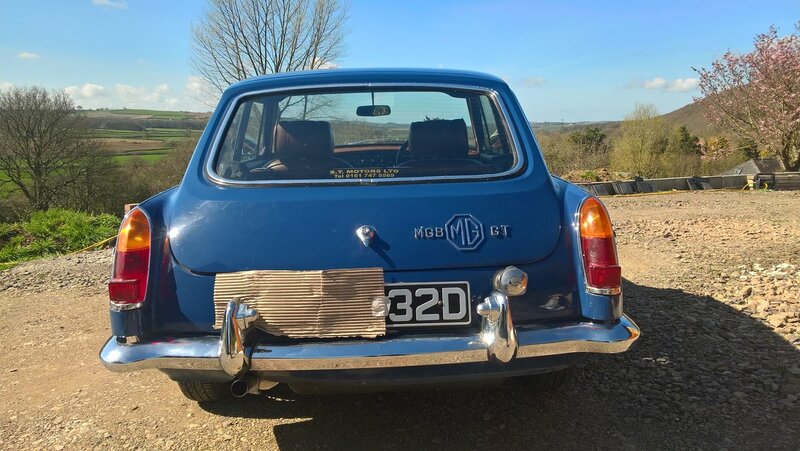 However, it needs work to pass an MOT: new dust covers/boots on ball joints; some remedial welding, particularly around the front rear spring hangers is needed, and both rear light indicator lens are cracked, it passed the emissions test. Technically of course the car is now MOT exempt, but there’s no substitute for a thorough professional check. Main advisory: most of the welding that has been carried out in the past is generally sufficient to pass an MOT, but some of it is very untidy and considered in need of remedy, eg some repairs missing full seam welds. The driver side is generally much better quality welding than the passenger side. As a minimum the seam welds should be remedied. However, this is a fiddly and time-consuming exercise. 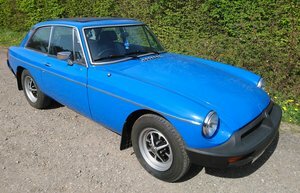 They recommended that it would be more cost effective to replace the passenger side sills and floor pan and the rear spring front mountings rather than make good the existing patchwork of repairs. Details and cost estimates available upon request. 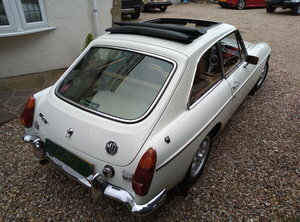 The main changes required to return it to the 1966 spec are to the interior, which has tan coloured seats and trim colour from a much later model. 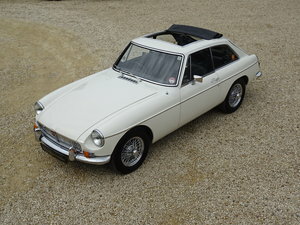 It is fitted with electric windows, remote control central locking, the dash has been modified (with incorrect layout, a later model indicator stalk and tan vinyl covering) tan vinyl front and back seats (in very good condition) and matching trim, centre arm rest console, black cloth head-linings, gas rams for bonnet and tailgate and electric push button starter. It is currently fitted with (correct) black carpet throughout, except where it’s missing from the front footwells. I have some parts, e.g. sun visors in the correct light grey colour. The (currently) missing air filters and front bumper will be fitted prior to any sale. The tan coloured vinyl front and rear seats, and the tan interior trim panels can be exchanged for black vinyl items. 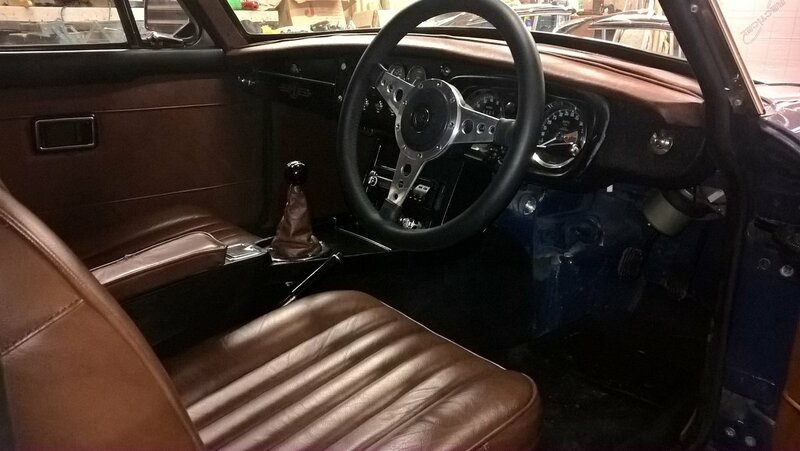 The front seats can be exchanged for black leather items (no head rest) as per the original 1966 spec. If the rear seats cannot be exchanged, then they will need to be re-covered in black vinyl. Additional information, photos, etc all available upon request.